Today, with 3-D printing, you can make almost anything in a matter of hours. However, making sure that part works reliably takes weeks or even months. The technology to speed up qualification and testing was the result of Sandia materials scientist Brad Boyce's challenge in the spring of 2015. Boyce was working on a Laboratory Directed Research and Development-funded project to improve the qualification of custom 3-D-printed parts. 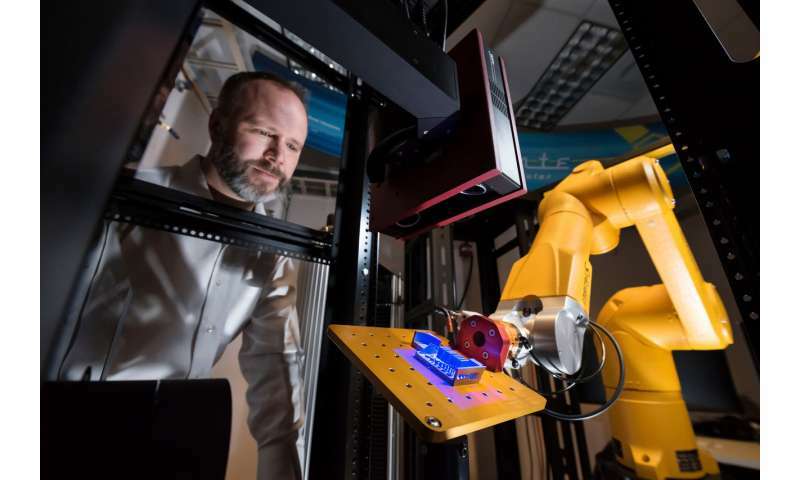 Boyce had already developed a machine for high-throughput tensile testing—pulling on an object until it snaps—but for this project he knew he needed a more general, flexible solution. He turned to Sandia's robotics group. The prototype Alinstante work cell only has two testing stations and a rack where users can place their parts. The first station is an off-the-shelf structured light scanner that can convert a scan into a 3-D model for direct quantitative comparison to the original intended design. The second station is a load frame for testing physical properties, such as tensile and compression testing, which is pushing on an object until it crunches. "Right now, Alinstante is really just scratching the surface of what it could be," said Boyce. "We could integrate the printer, processing systems—such as a heat-treat oven or a grinder—and many other post-processing tests." But even before this vision becomes reality, Alinstante can provide significant benefits. Boyce said, "Friday afternoon you tell the 3-D printer 'I want you to print this part 10 different ways and then go test each one.' You come to come back Monday morning and Alinstante tells you which process was the best. Let the robot do all the logistics work and get the human out of the loop except for making the important engineering decisions."